One day this year I finally learned how to long line. It has taken the last 30 or so years, slow learner you say? You’d be right. Over the last 30 years I’ve managed to pass many a check ride for firefighting including the long line portion. I know, some of you are saying what’s a long line? Good question, so we’ll start there. 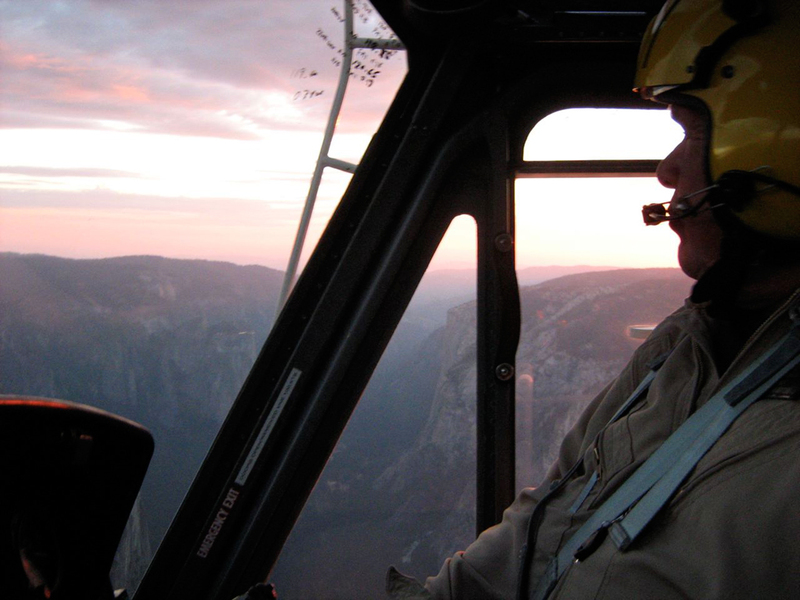 One of the major reasons the Forest Service pays so much money to employ helicopters on forest fires is the helicopters ability to operate in remote and wilderness areas. When delivering supplies to the fire fighters on the ground often you must sling the supplies under the helicopter on a long line or sling. These supplies are then lowered to the fire fighters, down through the tall trees and in steep terrain. The helicopter, unable to land, uses the long line to deliver food, water and even people (repelling from the helicopter) in support of the fire fighters (of all the things we do in support of the fire fighter, I think they most appreiacate the long line missions most). A typical long line mission often starts at the helibase, which maybe several miles from the fire. Typical of a long line cargo net for my helicopter will consist of MRE’s, meals ready to eat, drinking water, tents and sleeping bags. These items are placed in a cargo net and weigh up to two tons. While the helitack folks are putting the load together, I find out the altitude I’m delivering the long to and figure out my allowable load with respect to temperature and altitude above sea level. One of my long line missions this summer was at 9,500 ft. Pulling out a load of smoke jumper gear. 800 pounds was all the Bell 212HP could lift that afternoon. As soon as helitack has the cargo net ready we connect a 150 long line, a braided metal cable with a remote hook on the end of the line between the cargo and long line cable. First we check to see if I can jettison the entire load from the main cargo hook on the belly of the helicopter, I have two ways to drop the long line and load, one is electrical and the other is a manual release. Then we make sure when I place the load on the ground, with the fire fighters, I can jettison just the cargo net and supplies. That way I bring back the long line and remote cargo hook so I can take out more loads. Then its show time, where the rubber meets the road, where the boys are separated from the men, it’s the time where my pucker factor is maxed out! The following is how I long line, as this is not an exact science, more like an art, helicopter pilots beware, and they’re many different ways to long line. I pull up the helicopter to 15 or 20 feet in altitude and then transition to the bubble window and look down at my line and the load. I continue to hover up to 150 feet above the ground, gee its high up here! Looking out the bubble window and back under the helicopter I try to slow down everything, I mean everything. I’m moving the controls the least amount possible. As the cargo net breaks ground any unnecessary movement of the controls will translate to cargo movement. I slowly pull in power (up on the collective with appropriate left pedal keeping the helicopter centered with cyclic) and peek back in at the instrument panel to see what my power is. At this point in my career I can usually tell how much power I have pulled by how much-left pedal I have pushed in. If I’ve done my load calculations correctly, I’m pulling about 80% of available power as the helicopter starts the vertical journey. The helitack guys are talking to me on the FM two way radio, line tight, cargo off the ground, 20 feet, 40 feet and load clear of the trees. I’m on my way to support the guys and gals on the fire crews that are doing the dirty hard work of putting out the wild fires. Enroute I keep my speed down to 60 or 70 knots, some loads may not fly at any speed over 40 knots. Slow is good. Into the wilderness I fly with external load gently swaying underneath the helicopter. Now I pray my special prayer, “Please Lord help me pay attention to what I’m doing”. Now is not the time to daydream or look at the wonderful scenery, if I PAY ATTENTION TO WHAT I’M DOING, I just might survive one more fire season. Long lining is not only the most challenging and difficult work I do…but it is the most dangerous thing, by far, I do with a helicopter. My friend Dennis Davis was killed in Happy Camp California this year on a long line mission. I’ve programmed my Garmin GPS with coordinates of the drop site for the cargo. I’m near the drop site and call the folks on the ground that I’m near, they respond with my location from them, were at you 12 O’clock one-half mile keep coming. See the drop site down in the trees on a steep side hill. The firemen are looking up at the hovering helicopter thinking of a food and a warm sleeping bag tonight. Now I start the really hard part of the long line mission and I’m thinking, “don’t screw up now Ken”. The last phase of the missions actually started back several hundred yards back when I slowed the big twin Huey down to just above translational lift speed (20 to 25 knots). As I near the site I try to lose altitude so the load is not more than 100 to 200 feet above the treetops. I slow down to hover speed of five knots or less. Here is the secret to long line success…go slow then slower, slow is good, slower is better. All you aspiring helicopter pilots out there…if you want to be a good long line pilot…SLOW DOWN! I can see the drop site and I transition into the bubble again, slowing all the while and losing altitude so that as I come to dead stop, the cargo net is a few above the treetops. At the same time I move the nose of the helicopter to the right about 45% from my SLOW LINE OF TRAVEL. I’ve found that if I keep the load under the center right side of the helicopter I can swing it out to left (the side that I’m on) and continue to descend into the drop site. “Helicopter 520, load is 100, 50, 20, on the ground”. At this point I release the cargo net with the remote hook. “Helicopter 520, load is released, hooks off the ground, 50, 100, 150, your hook is clear the trees, good job 520 and THANKS”. NO! Thank you Mr. and Ms Fire fighter for letting me serve you in your noble endeavor!